Today, we want to share with you the best cheap go karts for sale that the whole family can enjoy! Whether you have a teenager looking to go fast, or a little one who needs to start out slow, we found a variety of go-karts for everyone – and for every budget! Before you buy a new go-kart, there are a few important features to know about to make sure you get the right one for you! Let’s go! Power: There are three main ways to power a child’s go-kart: pedal, electric, or gas. Pedal-powered go-karts have no engine – they power it with their feet like a bicycle! Electric motors use rechargeable batteries, and gas engines use, well, gasoline! Weight Limit: To ensure your child can ride safely, we let you know the weight limit for each go-kart. Riding a go-kart when you’re over the weight limit is dangerous because it can cause injuries from tipping, brake failure, or engine failure. Age Range: In addition to knowing the weight limit of your go-kart, it’s important to note the suggested age range as well. 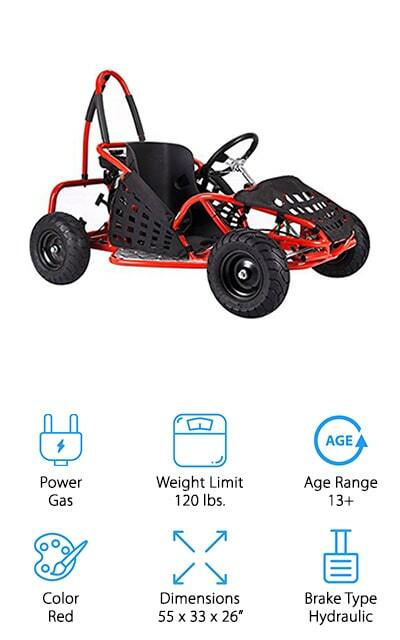 This allows you to choose a go-kart that’s age appropriate for their weight, height, and driving ability at various speeds. Color: Finding a safe go-kart for your child based on age and ability level is our #1 priority. We also found a variety of colors and styles to make driving around fun, too! There are several options any kid will enjoy! 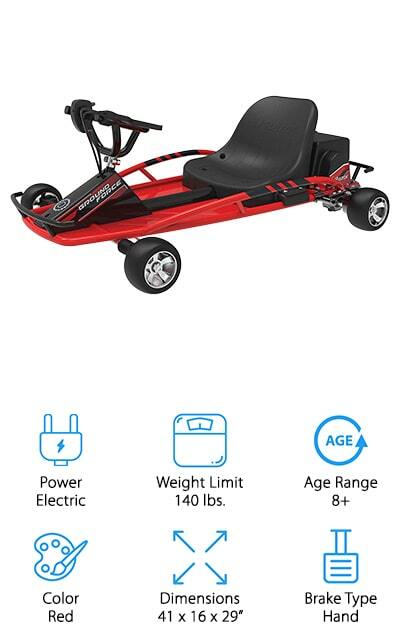 Dimensions: We also let you know the dimensions of each go-kart to help you find one that’s the right size for your child. You can also choose a go-kart to fit your lifestyle, especially if you are short on storage space! Brake Type: Handbrakes work by pulling a lever on the side of the go-kart. Hydraulic brakes use brake fluid and work by pushing a pedal, just like in your car! Pedal brakes work just like regular bicycle brakes to stop tires. Now that you know what kind of go kart you need to suit your needs, let’s find one that suits your budget, too! We found 10 go karts that are inexpensive without sacrificing safety or fun! From pedal-powered models for toddlers to gas-powered speedsters for teens, there’s something for everyone. If you’re pressed for time, no worries! Start with our Top Pick and Budget Pick today, and come back later to read about the rest! Let’s get into the reviews! The Top Pick in our hunt for cheap go karts for sale comes to us from Razor. 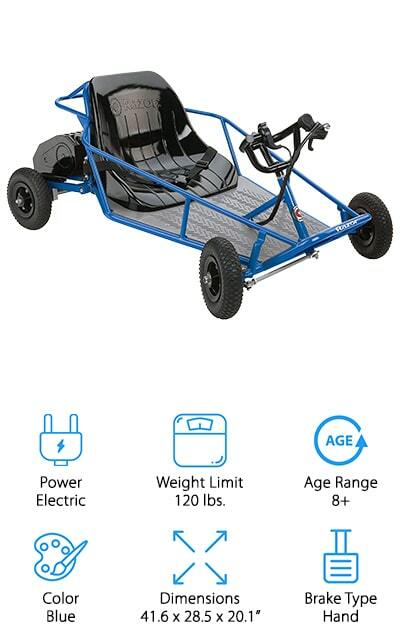 This go-kart is great for kids 8 and up to zip around their backyard, fields, and trails. We like the vintage style of this go kart, which looks just like one you may have had when you were a kid! The steel roll cages on the side keep your child safe if they accidentally tip it over when turning too fast. We also like the padded bucket seat, which keeps your child safe and secure. 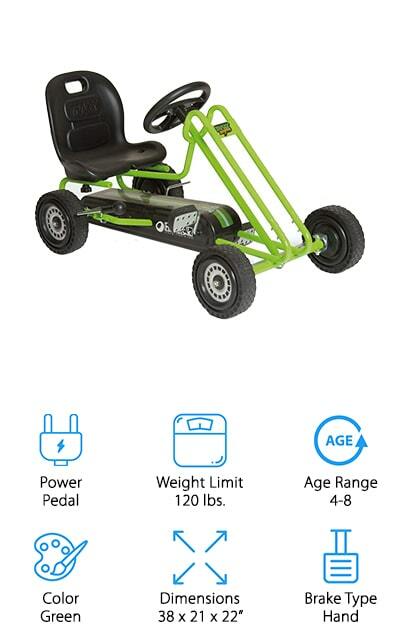 This electric-powered go kart comes with 2 rechargeable batteries, so you can charge one battery while driving around with the other! The motor maxes out at 9 mph, which is a safe speed for young children without seeming too slow to your little speed demon! This is a great go kart for young kids who want to enjoy the speed and freedom of cruising around the yard! 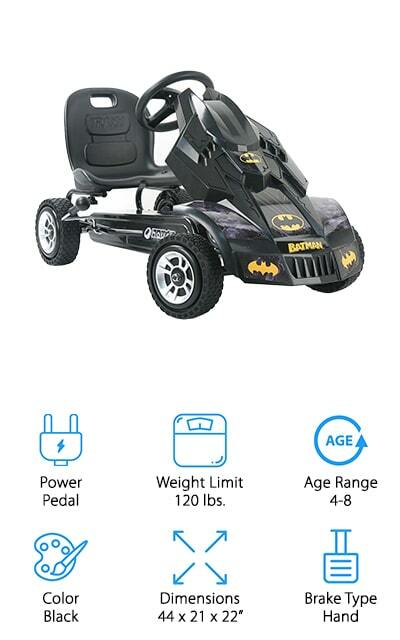 If your child wants to enjoy speeding around the neighborhood while saving everyone from bad guys, this Batmobile go-kart from Hauck is great! This inexpensive go-kart doesn’t use a motor – it’s powered by your little superhero’s pedal power! No need to buy expensive replacement batteries, or maintain a gas motor! 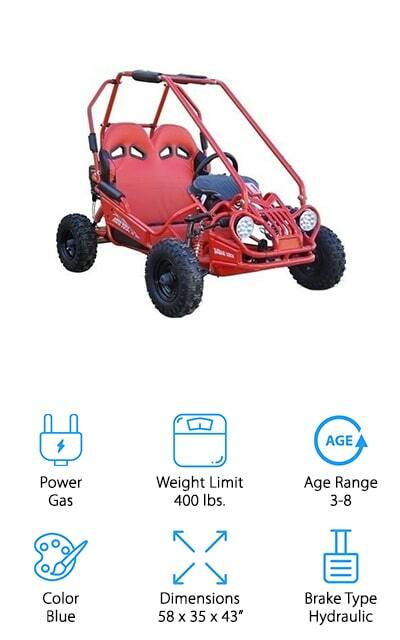 This go-kart is for kids ages 4-8, with an adjustable seat to fit them perfectly. The race-style pedals are easy to grip, and the rubber wheels give them plenty of traction on pavement. The 8-ball style brake handle is easy to grip, and the 3-point steering make this easy for even small children to maneuver in tight spaces! We also like the Batmobile front and decals all over, which make it look just like your little superhero is riding around in the real thing! This is one of our favorite go karts for sale if you’re looking to save some money without having to sacrifice on fun! 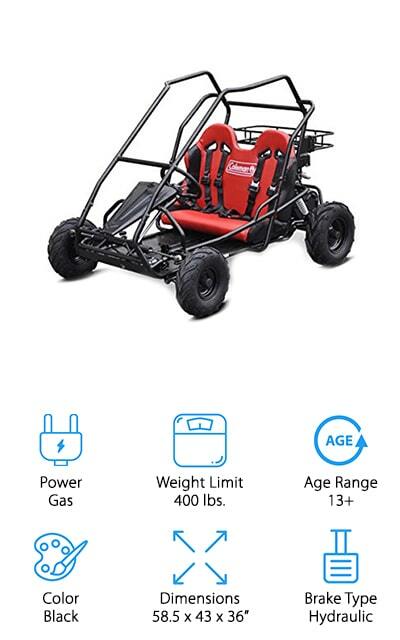 If you’re looking for gas powered go karts for adults and teens to enjoy together, this 2-seater go cart from Coleman is great for everyone! This gas-powered is made for kids 13+, and it can seat up to 2 people comfortably. To keep your child securely fastened into the kart at all times, it comes with a 4-point safety harness in each seat. We like the full roll cage with padding to keep your child safe if they tip over. While it can go up to 31 mph, there’s a speed governor to limit the top speed and a kill switch to shut the motor off in an emergency. It can also hold up to 400 pounds, so it will grow with your teen into adulthood! This is a great go kart for teens and adults to take on a trip on the trails, or tear it up on dirt tracks or open fields for some crazy fun! Next up is another pedal-powered go-kart from Costzon that your small kids will enjoy riding around! It looks just like a real go-kart, minus the roll cage! We like that it uses pedals to operate instead of needing batteries or gas to run. This way, your child can ride anytime without needing to wait for batteries to charge or learn how to shift gears. The tires come with anti-slip strips, which allow your child to ride on grass, pavement, and even indoors on rainy days! We also like that it comes with a deep bucket seat with a high back, which helps your child stay in their seat while tearing around the yard or during sharp turns. We think this is one of the best go karts for your little ones to introduce them to riding in a go-kart, basic traffic rules, and safety rules for when they get into a real go-kart someday! Next up is a great go kart to introduce your child to the traffic and safety rules of driving on the road! This gas-powered go-kart from Monster Moto has a 79.5cc engine that can go up to 18 mph, depending on the weight of the driver. We like that the interior is roomy enough for your child to grow into it, and the seat is adjustable to your child’s height if needed. The steel frame has side roll cages and a high back to keep your child safe if they roll it over. We also like that it has a clearly painted gas pedal that’s green, and a hydraulic brake pedal that’s red, so your child won’t get confused about which one to push if they panic! 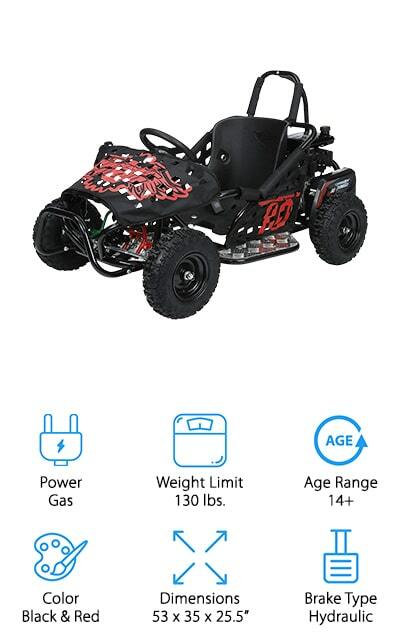 If you’re looking for your child’s first gas-powered go-kart, this is a great option that is both safe and a lot of fun to take off-roading or drive around the yard! When your child is ready for a gas-powered go-kart, this mini 2-seater version from TrailMaster is great for kids ages 3-8! It truly is a miniature version of an adult go-kart, with a full roll cage, 5-point harnesses in both seats, and adjustable seats to keep your child safe and secure. While it can go up to 12 mph, there is a speed governor you can use to lower the top speed for small or inexperienced children. We also like that this comes with a remote control that can start the engine and turn it off with the push of a button. This is great for parents to give them control if their child goes too far away or gets into a potentially dangerous situation! For some added safety and fun, it also comes with LED headlights and a horn they can use to see better in dark conditions and to alert other riders if they need to! If you want to give your child the freedom of speed without dealing with a gas engine, this electric go kart from Razor is a great option! Each 12-volt battery gives your child up to 45 minutes of driving time. It comes with 2 batteries, so you can charge one while using the other! This go-kart is made for ages 8+, and it can go up to 12 mph to give your child plenty of speedy fun! Your child controls the gas and brakes from the steering wheel, so there is no need to learn how to use pedals. We like that the frame is nice and sturdy with side roll cages and that the seat comes with a seatbelt to keep them securely in the vehicle while driving. It even has a space in the back to place a flag! This is a great go kart for a go-kart track, off-roading, or just zipping around the yard! If your teenager wants to get a go-kart to take on a racing track, this speedy little go-kart from Go-Bowen is great! The steel frame has side and back roll bars to keep your child safe if they tip, and the 4-point seatbelt keeps them securely in their seat. We also like that this has a soft steering wheel that has plenty of grip to help your child steer through fast straightaways and sharp turns. Another safety feature we like is the remote kill switch you can have on hand in case of an emergency, or if your child travels a bit too far away for your liking. The top speed is about 18 mph, which is plenty fast enough for ages 13+. If you want your child to take it slow, there are 3-speed settings you can choose from: low is 7-8 mph, medium is up to 12 mph, and high is up to 18 mph! Last up in our reviews is this cheap electric go kart for your little ones to race around the yard! It looks just like a race car, with racing decals, lights, and a music button! 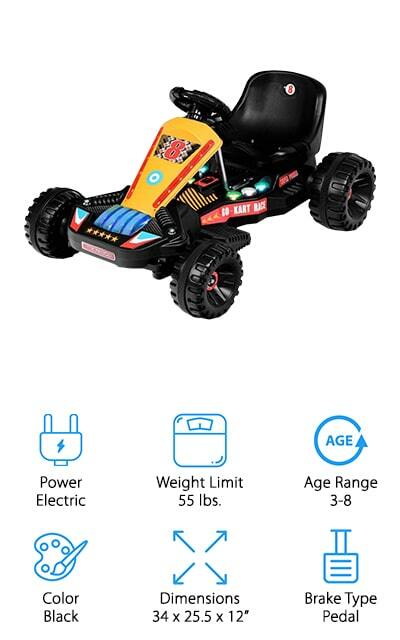 It uses a rechargeable 6-volt battery, which gives your child an hour of racing time with each charge! If you’re worried about speed, no problem! This go kart tops out at 2 mph, which is fast enough for your child to enjoy, but slow enough that you can catch up to them quickly! It’s made for kids 3-8 years old, and it’s super easy to drive. The go-kart moves forward when they push the pedal, and it automatically stops when they lift their foot off the pedal! Easy as pie! It also as a reverse switch if they get stuck and need to back up! We think this is a great go kart for little ones who dream of being race car drivers someday! When looking for cheap, fast go karts that wouldn’t break the bank, we found that pedal-powered go-karts like this one from Hauck were a great budget option! 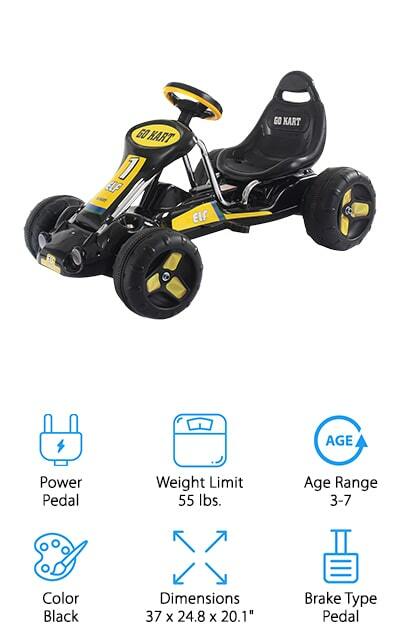 This go-kart is great for kids ages 4-8, and it looks just like the go-karts they see grown-ups riding around! We like the simple design, no batteries or gas needed, and that it comes in neon green or pink so your child can pick their favorite color to drive! The padded bucket seat keeps your child securely in their seat without the need for a seatbelt, and the steel frame is sturdy and prevents tipping. We like that the steering is easy and accurate, and the 8-ball style handbrake works quickly to stop your child’s go-kart quickly. The tires are made of durable rubber, so they can ride this on pavement, grass, and even take it indoors to the basement or garage on a rainy day!